Discussion in 'Divine Juice' started by Divine Juice, Jun 5, 2017. Have you tried one of our juices/doublers or other products? Did you love it, did you hate it? Gasman and DogMan like this. This is great, Mr Panda. Takes a special kind of company to accept public review whether good or bad. I'll try to get something up in the next few days. Pippi and Divine Juice like this. We want honest opinions, not hype! If this is a few days, I'd hate to see how long your week is! Pippi, iamTezr and DogMan like this. Divine Juice and Pippi like this. Cherry Cigar is true tobacco blend ejuice that taste more real tobacco than just a flavoured ejuice. Like I mentioned to Pippi it has a slight dry tobacco taste but smooth. Comparing to what I've tried or mixed, they are either vanilla or sweet with slight tobacco tasting, this has a nice balance of tobacco and some other flavors that I'm unable to pick up(must be Noes special blend). It's definitely something that you can enjoy with a drink or two. If you fancy tobacco flavor then this is worth a try. That's my additional 2cent to what I think of Cherry Cigar. Edit: I'm vaping it at this moment and you do get a much more nice tobacco taste by vaping it as if it's a real cigar. A while back I purchased a 15ml doubler of Cherry Cigar from Divine Juice. This came about because over a year ago Noe sent me a little sample of ready to Vape CC. I liked it a lot and vaped that whole vial in one day. I need to say I am not one for doublers and have only bought three in nearly three years of Vaping as I went straight from premixed to DIY and skipped the doubler thing and to be honest I think I stuffed up the ratios in all three. Anyway the Cherry Cigar is full of flavour yet subtle - one could expect some sweetness from the Cherries but I didnt really note it - which is a very good thing as sweetness in a Vape is like kryptonite to me. The Tobacco flavours are gentle and dry - yet smooth. I sampled it in a Kabuki at low watts and then in my Guardian Pipe at around 20 watts - The pipe delivered a more satisfying vape and the CC was lovely in the Pipe with a glass of Mr Black on the Rocks after dinner. This is a juice for lovers of fine Tobacco flavors and many would enjoy it. I also mailed a little sample to @iamTezr and his taste buds are clearly better than mine. See his comments quoted below. "I tried the Cherry Cigar. It's a dry mild tobacco flavor. It's best with some wine definitely. I haven't tried many tobacco flavour maybe 2-3 and tried DIY some clones and have to say that Noes cherry cigar is way above the clones I've mixed. I probably vaped 1ml of it trying to figure out the flavours behind it and just couldn't. I have never smoked cherry cigar which Noe has based the juice on so its hard to make a comparison. For the cherry cigar I found that I was getting more flavours not by DL or MTL but by having it in my mouth like as if I was smoking a cigar. It has a mild tobacco flavour that's not overwhelming the cherry/black cherry flavour. Thanks for letting me try the cherry cigar." iamTezr, MetalOz and DogMan like this. Update after very long steep. I had planned to try baklava again prior to writing that. But the "nut" flavour softened over several weeks, giving way to something more like clove/cinnamon or similar. Better now. I think I'll dilute it though. @Charles Vaper wrote an excellent, detailed, review of our Bewdy Ejuice! Bewdy is the type of tobacco e-juice one could vape all day and I'll be placing an order for this and another flavour next week. As I've mentioned in the past, I'm not fond of the majority of commercial e-liquids, so if you wish to try something that is made with extra dollops of love and TLC, give it a whirl. 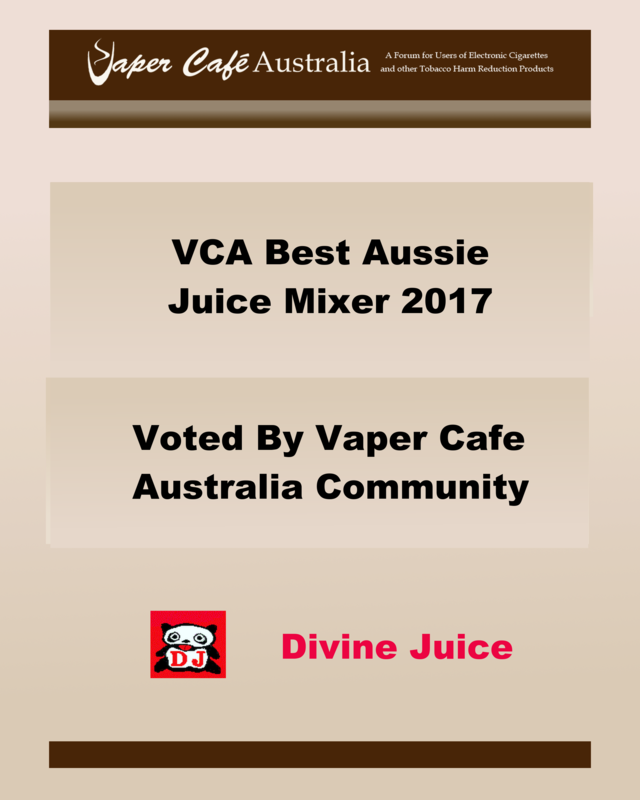 Divine Juices are proudly made in Australia, we should be supporting their efforts. You are spot on about it being an ADV tobacco ejuice though, we have long standing customers, who have vaped Bewdy as their ADV, in some cases, for as many as 4 years (pretty much since when we began offering it to other vapers). We feel it is testament to how good the flavor is that these vapers have never tired of it & continue to use it as their main or only ejuice.